Healthy Origins Green Coffee Bean Extract 400mg is a dietary supplement for adults which claims to be a potent antioxidant standardized to contain 50% Chlorogenic acid and 65% polyphenols. The supplement claims to provide the body with the essential nutrients which are usually lost during the roasting process of coffee. These properties are aimed at helping you to lose weight. The manufacturers of this supplement are based in Pittsburgh Pennsylvania. Healthy Origins Green Coffee Bean Extract contains 400mg of green coffee bean extract which is standardized to contain 50% chlorogenic acid. The manufacturer claims that this product is non-GMO and contains no soy, fish, nuts, tree nuts, dairy, wheat, gluten, yeast, sugar, or salt. It is packed in veggie capsules made of cellulose, rice flour, and vegetable magnesium stearate without the addition of artificial colors, flavors or sweeteners. This supplement contains 3% caffeine. Green Coffee Bean Extract comes with easy to use instructions. As a dietary supplement, an adult is supposed to take one veggie capsule twice a day with water, 30 minutes before a meal. We have not yet come across any severe or adverse side effects associated with the use of Green Coffee Bean Extract. The manufacturer has not indicated if this supplement can be combined with other products or prescribed medication. However, we recommend that you consult your doctor before using this supplement if you are on medication, pregnant, lactating or below 18 years of age. A bottle of Healthy Origins Green Coffee Bean Extract containing 120 veggie capsules is retailing at a discounted price of $24.99, down from $54.99. You can get a promotion code on their official website for a discount. All purchases at Healthy Origins exceeding $100 are shipped for free. International purchases are given different shipping options at check out. We could not find if there are special offers or discounts for customers who purchase in bulk. There is no mention of a money-back guarantee on the manufacturer’s official website for clients who are not satisfied with the results. This is perhaps because the product is not as effective as it claims. We also could not find any user reviews on their official website. This can be an indication that this is not a widely used product. 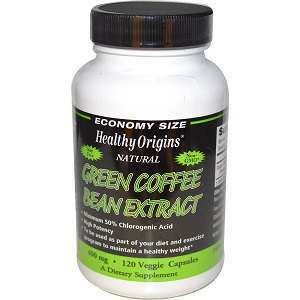 Healthy Origins Green Coffee Bean Extract 400mg could possibly be helpful if you are trying to shed the extra pounds. It is made of natural ingredients that don’t come with any adverse side effects. Additionally, the manufacturer has clearly stated the ingredients on their official website. Nevertheless, this supplement has some shortcomings. There are no user comments or reviews on the manufacturer’s website. Additionally, we could not find verified clinical trials to prove the efficiency of this formula. It is also relatively expensive compared to other weight loss supplements available on the market. Edward Tobias	reviewed Healthy Origins Green Coffee Bean	on December 12th	 and gave it a rating of 2.